Walking your dog is a very important part of your and your furry friend’s life. National Walk your dog week was founded by Colleen Paige to bring attention to the problem of behavior issues and obesity in the canine population. If you walk your dog just 30 minutes a day you will meet national recommendations for heart health, says Paige. Walking is not just a part of physical health for your pooch but mental health as well. So grab that leash and those dog bags and get out there! There are a lot of different types of collars and harnesses to choose from, which can make the task seem very daunting. Once you know what kind of walker your pup is the decision becomes a bit easier. For the properly trained loose leash walker you should be fine with a typical standard flat collar. If you have a shorter nosed dog, like a Frenchie or a Boston, you may want to go with a back clip harness. This can help avoid exacerbating the breathing problems these dogs tend to have when going on longer walks. If your pup likes to pull a little bit and gets a little too excited when she sees a squirrel, a front clip harness may be for you. This helps prevent minor pulling and allows you to steer the dog a little more easily. If you want to speed along the leash training process you may be interested in a head halter, similar to the Gentle Leader or SnootLoop. These help your dog focus more on you when walking instead of sniffing their surroundings. Dogs learn more quickly when their attention is on you instead of when their nose is to the ground. Also make sure that you and your pup have some sort of reflective device on so any passersby can easily spot them and you when the light starts to fade. Cesar Millan has some good tips on how to make the most of your walk including where to position yourself and the kind of leash to use. Healthy Pets also has some pointers on proper technique and how important it is to your dog’s health to walk and get exercise regularly. 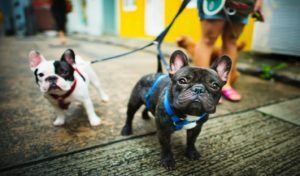 They also instruct when it is proper to take your puppy out for a walk and some basic instructions on teaching your pup to walk on a leash. And the American Kennel Club has a good page on how to teach the young pups to walk on a leash properly and how to trouble shoot those problem walkers. Most of all enjoy the exercise for you and your pup! ViaGen Pets is the worldwide leader in the cloning the animals we love! To learn more call us at 888-876-6104.